On the field, in the stands, or on the street, the Sousaphone is one of the most recognizable instruments in the world. Now a staple of show bands and parades, the instrument had its start in the late 1800s as a piece in John Philip Sousa’s Peerless Concert Band. As the name suggests, Sousa himself conceived the instrument, but the identity of the original manufacturer of the Sousaphone was disputed between C.G. Conn and J.W. Pepper. That is, until now. A wealth of newly gathered evidence has proven that the first Sousaphone was manufactured by none other than J.W. Pepper. Much of this information was gathered through the efforts of Dave Detwiler. Mr. Detwiler is the pastor at LCBC Church in Harleysville, PA, as well as a lifelong music history enthusiast and a tuba player in the Montgomery County Community Band. His love of the tuba family of instruments is what led him to investigate the history of the Sousaphone. 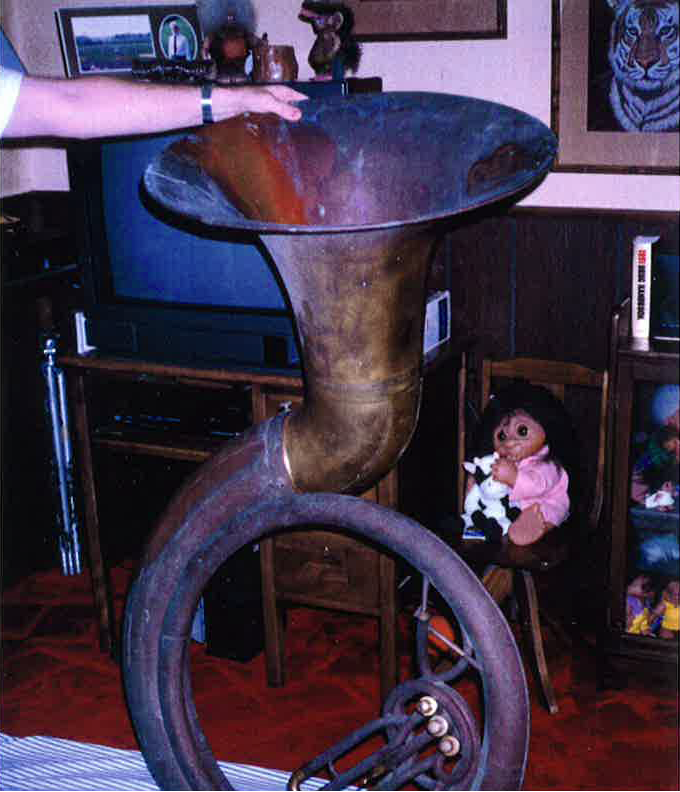 The original Sousaphone as it looked at the time of its rediscovery. The controversy settled, the only mystery left to solve was the whereabouts of the original horn. That part of the story skips over 70 years from when the original Sousaphone mysteriously disappeared, to its miraculous discovery in 1973 by a man named John Bailey. In 1973, Bailey had recently graduated from West Chester State College and was traveling with his mother and sister to a local flea market in Adamstown, PA. At the market, he noticed an old three-valve “rain catcher” Sousaphone. Recognizing the possible historical significance of the instrument, he purchased it for $50 with the intention of refurbishing it. The Sousaphone would then sit in storage for 18 years before Bailey found time to polish it. When he did, what he found was a shock. On the horn of the instrument, a series of engravings told the story of a pioneering instrument made especially for Sousa. In fact, John Philip Sousa’s face appears engraved on the bell in recognition of his design. He then contacted J.W. Pepper & Son, Inc., who quickly jumped at the chance to purchase the instrument, finally bringing it home after almost a hundred years missing. This brings the story back to Dave Detwiler. Mr. Detwiler approached Pepper with the idea of playing the original Sousaphone in concert for what would likely be the first time in over a century and J.W. Pepper wholeheartedly agreed. To prepare the instrument to be played, they brought it to Steve Dillon and Matt Walters of Dillon Music, both experts in the field of instrument repair and the care of antique instruments. Through their hard work the original Sousaphone was returned to perfect playing order. And play it did. In Mr. Detwiler’s able hands, the original Sousaphone joined the Montgomery County Community Band in concert on May 3, 2015. You can watch clips of the concert, parts of the repair process, and the full interview with Dave Detwiler at the top of this blog post or on J.W. Pepper’s YouTube channel. How wonderful! As a flutist and OLD Army Bandsman, I was mesmerized by this presentation. The first and original sousaphone was made by C. G Conn. It now resides in the Greenleaf collection at the Interlochen Center for the Arts. The curator of the collection, John Beery, can attest to its documentation and authenticity. You may wish to be in touch with him to learn more about it. Hi Heidi – thanks so much for weighing in on the original Sousaphone! I am very familiar with the horn you mention, as it sparked my interest in the early history of the Sousaphone. Back in the summer of 2012, I was visiting Interlochen with my family (I am an NMC alum, 1979, and was on staff at NMC, 1981, and IAA, 1984-86). I remembered that they had what was claimed to be the original Sousaphone on display in the Giddings Concourse, so I went to see if it was still there (I am a long-time tuba player, which explains my interest). This led me to a wonderful conversation with John Beery, who invited me to examine and even play that great old horn in the Greenleaf collection. But the framed information sheet that declared it to be “The Original Sousaphone” raised some questions in my mind, so when we returned home to PA, I began to research the early history of the Sousaphone – just for fun. What I eventually discovered, and shared with John, is that the Interlochen Sousaphone, with the serial number of 88983, and its distinct style, was built no earlier than 1903. The very first Conn Sousaphone looked quite different, and was introduced to the world in January of 1898. But the very first Sousaphone ever built came from the J. W. Pepper factory in 1895, as I share in the video above. This latter fact is fully documented, both through Pepper publications from both 1895 and 1896, as well as the testimony of John Philip Sousa in the August 30, 1922 edition of the Christian Science Monitor. And all of the facts above (along with other historical details) are fully documented in my article published in the Spring 2015 edition of the ITEA Journal – of which I sent a copy to John a few months back. The Interlochen Sousaphone is a fantastic old horn – but unfortunately not the original Sousaphone, or even the first Sousaphone built by Conn. But I do have a really cool picture of me holding it (and I saw one of you doing the same)! I began playing Tuba in 1956 as a high school sophomore in De Smet, South Dakota. I never intended to play it again but when I went to college in California the band director asked me to play tuba because no one had signed up to play the horn. II began teaching 5th grade in Torrance, California in a K – 8th grade. The school had a band, a Sousaphone, and no one to play it so I rehearsed with the band before classes began, The band director gave me the phone number of the Palos Verdes Symphonic Band and I was soon playing with this community band. The horn I borrowed was an old “Rain Catcher” Sousaphone. It was owned by an old circus band performer. I wish I knew more of the history of that horn but lacked the curiosity in 1965. In 1966 the horn’s owner moved and took the horn with him. I bought another old upright tuba from Milt Marcus, a tuba collector from Long Beach. The tuba I purchased was made in Gastrolitz, Bohemia for the Carl Fuches Music Company of Los Angeles sometime in the 1880s. I am still playing that Tuba in the New Horizons Band of Colorado Springs, CO. I am 75 years old, I have played tuba for 60 years and have owned my horn for 50 years. Nice milestones for someone who never planned to play after high school graduation. Life has many surprises. Fantastic article and exciting to know the original is back in service! I’m a former Euph player in the Commandant’s Own, US Marine Drum and Bugle Corps and I have a passion for anything Sousa. Great read! Hey Lelia (two comments up) – I don’t know if you’ll be circling back to read these comments, but I grew up in Torrance, CA. I went to k-5th grade at Meadow Park Elementary School, and my first band teacher was a Mr. Marcus. I wonder if it’s the same person you mention?! Which school did you work as a teacher? It’s great to know you are still going strong as a player at 75 – I would love to do the same! Good eye Dave! Thanks for bringing this gem back to the “Band of the Living” and not letting it rot somewhere. Kudos! Just to keep this thread, and the earliest history of the Sousaphone, up-to-date, it should be noted that I finally did find evidence that the original Sousaphone, built by J. W. Pepper in 1895, was played in Sousa’s Band. 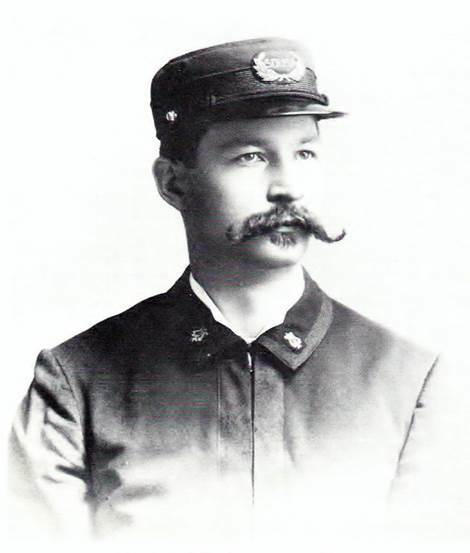 Here’s the link to the historic photograph that was discovered that changed what we know about that historic instrument: http://tubapastor.blogspot.com/2015/10/a-truly-historic-photograph-1896.html I also finally found a reference to Pepper’s new instrument in a newspaper article from the time of that Sousa Band tour: http://tubapastor.blogspot.com/2016/03/finally-check-out-this-1896-article.html The work of the historian is never done! Thanks, Dave for your work, and for sharing it with us all!